Universal Credit – the Universal Disaster Coming Our Way? After the Budget it is clear that whoever wins the election so-called “welfare reform” will go on. Once upon a time “reform” meant improvement but since the post-war boom ended, as far as the working class is concerned, it now means “make things worse”. Capitalism in a historic crisis at the end of a cycle of accumulation can no longer afford what workers forced it to concede after World War Two. With no strong class fightback since the 1980s our rulers have free range to aim their guns at the weakest and most vulnerable in society. For capitalism the welfare state costs too much. Thus we have seen the slow imposition of a class war from above on all aspects of the welfare state. For the past few years, under both Labour and the Coalition, 'Workfare' is and has been the favourite way for them to discipline and punish the unemployed. Workfare has a surprisingly long history. First mmoted by Major it was introduced by the Blair Government under the misleading name of the New Deal. Its transparent aim is to deliberately make claiming harder. 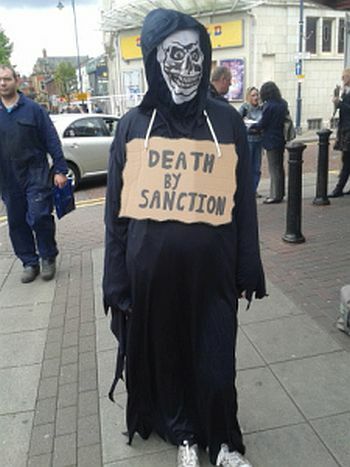 And the last Labour Government was no less vindictive than the Coalition in its implementation of sanctions. The attack on claimants it is not a one party affair. It meets the absolute needs of the capitalist state. The attacks have 2 advantages for the state. It not only shows that they are sticking the boot into “scroungers” and cuts the benefits bill but those on workfare don’t get counted by the Office for National Statistics (ONS) so unemployment appears lower than it actually is. And all the time it exerts a downward pressure on wages for all. It is no accident that one million people in the UK are now compelled to access food banks to survive. In a previous article [see leftcom.org] we also highlighted how the cost of the Jobseekers’ Allowance (JSA) has been cut through the use of arbitrary and perverse sanctions which can instantly cut off benefits which can only be restored weeks or months later. The main tool for this are the 'conditionality requirements'. These force the unemployed to face an endless grind of 'job searches' which are monitored – internet searches will be logged, and assume ready access to computers for up to 5 hours a day. Those in part time work with earnings below the hourly National Minimum Wage times 35, will be expected to increase their hours, or, if this isn’t possible, seek additional work - anywhere up to 90 minutes commuting time away. Sanctions are imposed on those failing to comply (though there's plenty of evidence to suggest that 'compliance' doesn't necessarily prevent sanctions). In the meantime under this regime too many have committed suicide or simply died of starvation. And worse is potentially waiting in the wings. Osborne announced in his Budget that there are still £12 billion in benefit cuts to come. He did not specify how. It just might be something to do with Universal Credit the vanity project of Ian Duncan-Smith (IDS). His notion of a new flagship benefit system was announced at the Tory party conference in 2010. It had been envisaged, we are told, by IDS close to the time he was deposed as leader of the party 7 years earlier. The idea of the new system is to consolidate 6 major benefits into one, simplifying, making things easier (for who? ), but above all cheaper. One benefit created to deal with what had been Working Tax Credit, Child tax credit, Housing benefit, Income-related employment and support allowance (ESA), Income-based jobseeker's allowance (JSA), Income support . The project has not yet got beyond the pilot scheme in the North-West, and thus far, it has been run by more than 5 chiefs. Only around 18,000 people are currently receiving it. It was supposed to have been rolled out fully in October 2013, it is still not in full and proper operation. The government has thus far involved IBM, Accenture, Atos, Hewlett-Packard and more to provide fixed features within the system. A new company Maximus has taken over the whole contract, for an undisclosed but very large fee. The National Audit Office has already issued a report providing 'withering condemnation' of efforts made so far, the leadership, lack of transparency, 'the good news' culture that spins everything rather than providing honest responses. The Public Accounts Committee has also issued criticism – management of the project described as “extraordinarily poor” and “alarmingly weak”. They have also questioned whether anything will be properly ready for use by 2017, 4 years later than advertised. It has been reported laughingly yet tragically that DWP office secretaries had been given the power to authorise payouts of up to £20 million, no-one knows what for. Capita is one of the companies with a prospect of a UC contract. They are supposed to take over initial interviews of claimants. Where they currently do this rather than DWP officers they have consistently failed to deal with matters promptly, they fail endlessly. But this is something to be expected of major corporations supplying services to the government. Serco have recently been involved in further human rights atrocities at the Yarl's Wood Immigration Detention Centre. ATOS had a direct responsibility for countless deaths from botched and inhuman 'work capability' examinations. [See leftcom.org and leftcom.org ]. IDS calls all of this a success. At the core of the disaster is the IT system needed to deal with all of the new features envisaged in the whole of the programme. So far over £350m (the figure may be as large as £660m) has been spent and effectively written off in failed IT systems, many of which had such a lack of security they were not fit for purpose and simply could not deal with all of the operations expected of them. Universal Credit may yet be abandoned due to the disasters highlighted above but it is not a given. For the state the ineptitude of IDS or those involved in wasting millions is not an issue. Their agenda is bigger than that. It is not just about cutting benefits but also about driving down the overall value of variable capital (that’s our wages and benefits) in UK plc. This is why they want to further privatise sections of the welfare state, providing the big corporations with more and more turnover and potentially bigger profits. No matter the human cost of further grinding down those on benefits, capitalism can no longer afford the poor, the sick, the old, the ill and the disabled. Can we afford to put up with capitalism? A timely article laying out the increasing horrors the bourgeoisie are forced by their failing system to impose on the poorest, least able and most depressed workers, and all to keep the stinking system going a bit longer. And then comes this delicious statement. The photographs a killer too! Thank you.